JPEG, TIF, RAW... file format names are the alphabet soup of digital photography and imaging. Here's a quick primer. JPEGs are compressed images best used for sharing your pictures on the Web or via e-mail. TIFs are uncompressed, which means the image quality is better than JPEG, and is most suited for your editing and archiving. And then there's RAW. While JPEG and TIF photos are processed within the camera, delivering a fully-defined picture to your computer, RAW is simply the raw, unprocessed data captured by your camera. To use the picture hidden in RAW--and gain the greatest degree of control over your images--you need software to convert it to a photo. That's where Phase One's Capture One ($129, 30-day free trial) comes in. 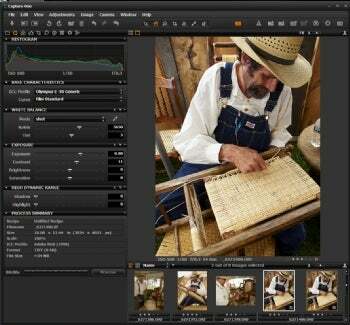 Capture One is a deep RAW processing program with professional tools that give you full control over your photographs’ exposure, color, dynamic range, focus and so forth, with high quality results. PhaseOne is best known for its digital backs for large and expensive professional studio cameras. (Backs traditionally hold the film in studio cameras, now they hold the digital capture components.) The software that comes with their camera backs has long been respected for high quality and efficient RAW processing. Now, it is available for most popular digital SLR cameras, including those from Canon, Fuji, Konica Minolta, Leica, Mamiya, Nikon, Olympus, Pentax and Sony. And it works with JPEG and TIF, as well as RAW. Why go to the trouble of processing pictures in software, when the camera will do it for you? It's a question of creative and technical control. Do you want the anonymous engineer who programmed the camera to make your editing choices for you, or would you rather do it yourself? And then there's the issue of image quality. If you know what you are doing, the photos from a RAW file that you process yourself could be far superior to those your camera would deliver as a TIF. Most top photographers shoot primarily in RAW, but RAW isn't just for pros any more. With the enormous popularity of DSLR cameras, more and more people are choosing RAW. Capture One is a deep program, with lots of professional tools that give you full control over your photographs' exposure, color, dynamic range, focus and so forth. One of its strengths is the quality of image you can get even from dark images, with minimal noise (those random dots of color and light that typically plague low light photos). On the other hand, that depth of features means that it requires reading the documentation and taking your time to learn how to use the program to its full advantage. Unfortunately, the program's User Guide and the QuickTime movies on the Website relate to Capture One's big brother, Capture One Pro. Many of the features, commands and tools mentioned aren't available in Capture One, which can be confusing. What's more, instructions and screen captures are Mac-based. However, Windows users won't have much difficulty extrapolating the information provided to make it relevant to the Microsoft interface. If you're the kind of photographer who used to like processing your film in a darkroom (or wishes you could have), you'll enjoy fiddling with your RAW files in Phase One Capture One. It's definitely for the person who wants to take the time and put in the effort to assure the best photos possible.